This book explores the nexus of Sustainability and Information Communication Technologies that are rapidly changing the way we live, learn, and do business. The monumental amount of energy required to power the Zeta byte of data traveling across the globe?s billions of computers and mobile phones daily cannot be overstated. This ground-breaking reference examines the possibility that our evolving technologies may enable us to mitigate our global energy crisis, rather than adding to it. By connecting concepts and trends such as smart homes, big data, and the internet of things with their applications to sustainability, the authors suggest that emerging and ubiquitous technologies embedded in our daily lives may rightfully be considered as enabling solutions for our future sustainable development. Section 1: Internet of Things (IoT), and “Smart Living”.- Chapter 1.IoT-Enabled Smart Living.- Chapter 2. 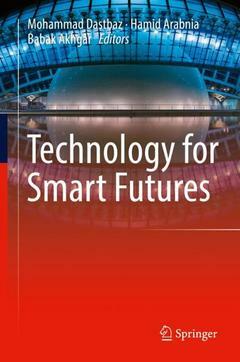 Emerging Trends in Cloud Computing, Big Data, Fog Computing, IoT, and Smart Living.- Chapter 3. Toward a Cognitive Middleware for Context-Aware Interaction in Smart Homes.- Chapter 4. A Path Planning Approach of an Autonomous Surface Vehicle for Water Quality Monitoring using Evolutionary Computation.- Section 2: “Smart Living” Case Studies.- Chapter 5. Big Data and Data Science Applications for Independent and Healthy Living - Five Case Studies.- Chapter 6. A Comprehensive Framework for Elderly Healthcare Monitoring in Smart Environment.- Chapter 7. Technology Implementation Case Studies: Lincus Software as a Service.- Section 3 Technological Challenges for “Smart Futures”, Evaluation and Monitoring.- chapter 8. Environmental Responsibility Assessment Using Uncertainty.- Chapter 9.Measuring and Classification of Smart Systems Data Traffic Over 5G Mobile Networks.- Chapter 10. Monitoring The Energy Consumed by A Network Infrastructure To Detect And Isolate Faults In Communication Architecture.- Chapter 11. Reducing Energy Consumption Of Network Infrastructure Using Spectral Approach.- Chapter 12.Virtual vulnerability - Safeguarding children in digital environments.- Chapter 13.Evaluation of the Dynamic Cyber Security Risk Using the Entropy Weight Method.- Chapter 14.Designing health technology: the ethical dimension.- Chapter 15.Testing the Comprehensive Digital Forensic Investigation Process Model (the CDFIPM).- Chapter 16. Systematic Literature Review Of Using Knowledge Management Systems and Processes In Green ICT And ICT For Greening.- Chapter 17.PCA Based Neural Network Model For Identification Of Loss Of Coolant Accidents In Nuclear Power Plants. Prof. Mohammad Dastbaz is the Deputy Vice Chancellor at University of Suffolk. Professor Dastbaz’s research work over recent years has been focused on the use and impact of emerging technologies in society, particularly learning, training and the development of “eGovernment.” Dr. Dastbaz has led EU and UK based funded research projects and has been the Symposium Chair of Multimedia Systems in IEEE’s Information Visualisation (IV) conference since 2002. He has over 50 refereed publications, including numerous journal paper articles, conference papers, book chapters and books on e-learning, eGovernment and the design and development of Multimedia Systems. Professor Dastbaz is a Fellow of the British Computer Society and UK’s Higher Education Academy as well as the professional member of ACM and IEEE’s computer society.